Auto table of contents generation. Thats not too much to ask is it ? I really don't want to re-create it all manually ! We have no plans to import any documents from any of the old Serif Plus range of applications. You can however use PDF files as a method of moving content to Affinity. Have you any idea of how much work goes into creating a 100 page PagePlus publication and a to offer PDF import will be a joke. I don't see why PDF is an insufficient transport format.. if both ends write / read PDF properly, it isn't.. But yes, what we're really saying is no - sorry.. So he can import it into PagePlus for Windows. what will he get ? Left and right master pages - I very much doubt it. Serif needs to consider this - manage the transition and exchange. This is vital to moving between Mac & Windows. Affinity applications are not Mac versions of Serif's Plus Applications. Affinity is a new range of applications that have their own file format, their own features and their own target audience. I agree with Paul C. Affinity are going to miss a big swathe of customers with this policy. Many users are quitting the Microsoft platform in favour of Mac - due MS's stubborn attitude in trying to manipulate its customers - and the customer is always right. There is a vast market out there who want something: the winner will be the one who realises that, and meets the demand. Serif users have to say goodbye to a loved product, (when ditching Windows). Adobe users are saying good riddance to the industry standard, on a hated price plan, on a loved platform. The Affinity team MUST treat both camps with equality. This is where the loyalty comes from. Serif and Affinity, you can do it! PS if there are any coders out there; a .dpp to .pdf converter on the App store would be fantastic! This is really disappointing news. I've used PagePlus since version 2 and I'm really happy with it. However, I am really fed up with Microsoft Windows and have now bought a Mac. I only use my PC for PagePlus now and was quite hopeful when I was told that Serif are developing a Mac publisher program. Whilst most of my publications could probably be imported via a PDF version this is not ideal. If there is another product out there for Mac that would read ppp files then I would buy it. As it is I will probably keep my Windows PC and see what the free upgrade to Windows 10 brings! Question for the devs: would it be possible to develop a file format and/or filter that can import the baseline structure of a pageplus document without necessarily importing the entire file in order to give pageplus users a point to recreate their document from in APub as opposed to having to rebuild from scratch if/when they come over to APub from pageplus? I was thinking that this transitional format could import the layout without linked pictures, text w/ formatting stripped out and retain some form of barebones master pages. PDF import will give you this structure. 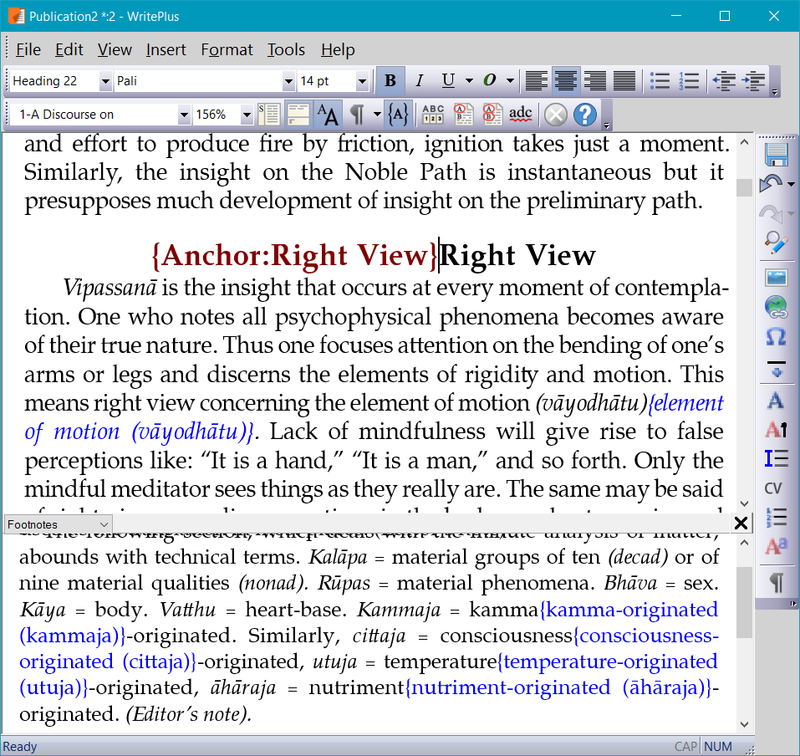 Use the APub when it comes out for new work and simple PP files that have been exported to PDF. Use PP for longer documents where text flow is important. If you need to redo a longer work in APub down the road (for whatever reason), then use them in conjunction via copy/paste text and relink to image files. The above is what I do no matter what layout application I choose or need to use for any given work. I think that Serif could and should improve on importing only PDF files. For posters, menus, or greeting cards it would be fine. For books, the flow of text between pages is crucial. I don't think it would be hard to provide an import filter for WritePlus files, which contain styles, footnotes, inline graphics, and index marks. The screen shot below is of a long WritePlus *.stt file exported from one of my books, and imported into a blank new document. Reflowing the text in a new Affinity Publisher document, then adding other content like master pages, tables, calendars, freely floating graphics, etc., would be relatively simple. Almost a year now since I posted the above, and we are still waiting for the first Beta. Here's hoping it has some way to import stories from PagePlus, or it will be useless to me. Rebuilding from PDF files is not viable for my publications, which are mostly for books with footnotes, contents, and indexes. The latter could soon be regenerated, but adding footnotes to a plain text stream is very time-consuming. We are still not sure if we will offer importing stories from PagePlus as the RTF format will give similar results for the features we will offer for version 1. Thanks Tony. I won't bother to test the first beta in that case. Sadly I'm with Bhikkhu Pesala there. I really can't understand why you can't just release the *.sst file format documentation to the Serif Community, as I'm sure that it's just a compressed XML-based file & there would be someone there who is smart enough write the translator for converting *.sst to an open file format. It is indeed just a zip archive containing a few xml files and images. Although I am sure it would not be beyond the ability of any decent coder to create an import filter, this is best done by Serif as they are familiar with the file structure and know all of the different kinds of objects and styles it can contain. An imported *.stt file contains inline images, footnotes, index references, and TOC anchors. Sadly, no crossover from PP to Affinity seems likely, so a lot of user support knowledge will evaporate, along with a loyal customer base from the Windows community. I agree with Bhikkhu Pesala in that Serif should be the people best placed to write a translator for their PP.xml files, but presumably they failed to document its development internally, so are not actually any better placed than anyone else. Even if Affinity is going to import *.rtf from PPX9, Serif failed to implement much of the last RTF spec in the PP>RTF export anyway. By RFT v1.9 MS had built in to RTF support for footnotes, contents and indexes, its just the PP>export that does not support later versions of the RFT-spec (although some of the information can sometimes be found in hidden characters in a pure text editor, or by a third party *.rtf importer). I'd be very surprised if the developers who are now working on Affinity Publisher don't all know PagePlus inside out. The easiest way to do this is to use the publish to pdf option in pageplus and then open the pdf with Affinity Publisher. You will then be able to edit your page plus document as needed.